This is a thread for designing some kind of recruitment strategy for getting tournament players to join the forums and play online. Need a design for some kind of paper to hand out to guys. With this day, and age of being able to just turn on your PS4, or Xbox1, and connect to anyone online for a game unless we simplify the experience, AND get a emulator that is at least equal to ZSNES this community will continue to die a slow death. I don't agree. We are here, in spite of those facts. I just think more people need to know about us, and we need to do a better job recruiting. As well as nurturing people when they do join. Of course we can do much more (demos at events, make videos, walk people through forum signup, etc. ), but those two things are simple and a lot of bang for the buck. Coincidentally, I just PMed Chaos last night to ask if he could make me 2 URL pages (nhl94.com/joinus, and nhl94.com/events) which I would like to manage (If a mod or admin prefers to manage them that is fine, but I am really hoping to personally step up and be more involved.). The "joinus" will have the latest, and most simple info on joining our community. The "events" will have a 50,000 foot overview of upcoming events (not sure if both online and live, or only live), with only pertinent details, plus links for more details. Yes, you can find these things in various places, in various threads, in various websites, but having 2 simple URLs like this -- which I would love to personally update -- would go a long way in simplifying things. These URLs are off of the main site, not forum threads. I think I can make a much more presentable page than a forum message allows. (Although having links to forum messages would be ok.) In the future, maybe even have a video or two explaining things would be even more valuable than text. Let's work on a draft of the flyer and the pages? It'll always be a niche, can't recruit everyone. But there are still retro players out there who will be blown away by this community. Maybe a monthly community newsletter for newbies and guys that don't visit the forum daily? This is true. We have an awesome community, and there is a lot for everyone, no matter your interest. I want guys to play online, but I know some people just like playing the custom ROMs (solo or with a local buddy), or want to learn to hack the ROMs themselves, and don't even care about online play. A flyer is a good idea, but maybe that should be done custom for each tournament. Just make sure they feature the nhl94.com/joinus URL somewhere obvious. If tournament organizers don't get them done, they can use the generic business cards. I think perhaps the nhl94.com/events page should just be a redirect to a forum thread that is pinned, which I would be happy to manage. (If you agree, Smozoma, I can just make a thread over the weekend, and you can pin it? Then we can figure out how to do the redirect, which will be pretty easy in PHP.) I picture the events page just having the most pertinent details for upcoming events, and then a link to the more detailed writeups on each one. After my first Classic season I was going to quit, I was terrible, and knew nothing about the actual game inside the game. I got lucky that a few spots opened up in the next GDL as soon as Classic ended, and decided to give it a go, and it sucked me in. With out that first GDL experience I wouldn't still be here, that, and the ability to get a game at almost any time of the day, and night I didn't have to hop on the CPU, and HOPE someone was out there willing to play there was always a few to a lot of buds looking for exis at that time (3 years ago), and 2V2 even thou I did not play back then was always popping off every night. Now it's a chore to seek out games it's hit, or miss depending on the night if anyone is around for exis, a lot is probably do to the lack of a draft league going on IMO, we really miss Brutus dude was awesome at organizing a draft league, and commishing it. Everyone keeps coming up with all sorts of theories, but it's simple. The leagues are PRO-slacker, and there is no incentive to play. Here is version one of a very simple "nhl94.com/joinus" page. The idea is to have a simple URL that will have some handy links to get a new recruit up and running as easy as possible. The "meat" would still be on the forum, where up-to-date pinned threads will exist that can be managed by me or a Mod or Admin. This is the mockup, of how is would look on a 700 pixel wide screen. We want you to be part of our community! The best way to get involved is through our forum. Are you a Genesis player interested in playing online? Click here to "Get Started With Genesis". Are you an SNES player interested in playing online? Click here to "Get Started With SNES". Maybe you are more interested in playing some custom ROMS? Or learning how to make your own? Click here for "Custom ROMs and Hacks". There are always upcoming live events and onlline leagues. Click here to "See Upcoming Events". You can also just do your own self-guided tour. Click here to "View our Forum" and see what interests you? We have thousands of posts on pretty well every angle of this incredible game. Maybe add a link to the standings and player stats for a season? So they can see how cool the setup is. That is a great idea. 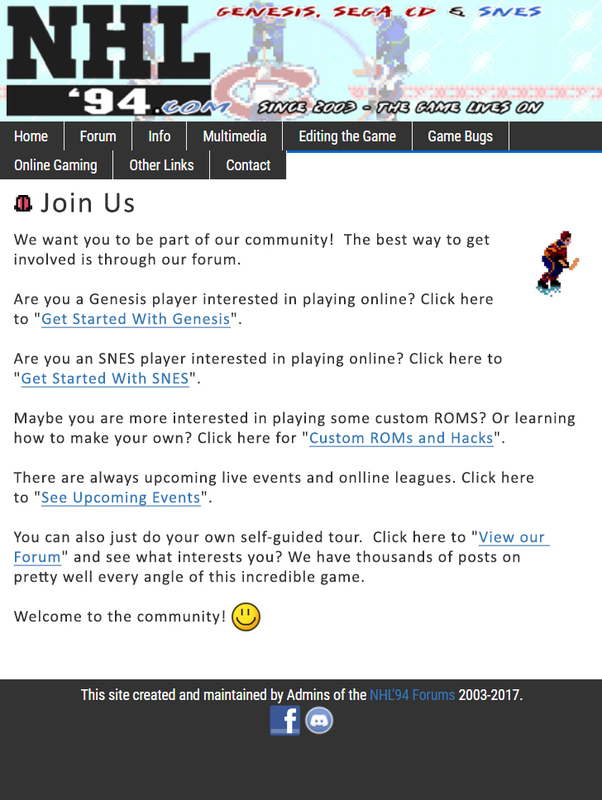 I joined the forum in 2005, and did not realize there was a functioning site that kept track of stats -- nhl94online.com -- until 2015! When I did I was blown away! Newbies might not know what a "ROM" is so maybe avoid that terminology or explain it. Perhaps also mention "with current 2018 rosters" or something like that? That should be a link on it's own. If folks get that far they might be interested in Rom hacking or Leagues, but the bottleneck seems to be getting set up. Whittle that down to 5 or less steps, and it'll be more attractive to newbies. How about a Challenge-your-buddy link, one that sends a pre-formatted email to a buddy showing them how to set-up and play? Have we ever looked into setting up an NHL94 server, as getting guys set-up on server would remove the step of needing Hamachi? It would at least get them playing quicker, with less set-up. Maybe we need to create an over-arching website/forum for all of retro sports, Tecmo, NHL93/94/95, RBI and hitch our wagons together. I like the way you are thinking, Jer! Some good ideas, including outside-the-box stuff! The newsletter was a good idea. It could be sort of a blog, and be available online at nhl94.com/newsletter. But everytime there is an update (monthly? quarterly?) an email could be sent out to those that have signed up. One concern is it sounds like a lot of work, lol! I can't comment on the NHL94 server? Maybe a Networking guy or someoone with experience guy can give there thoughts? An over arching Retro sport website seems like shooting for the moon, lol! (I like it, but it would be more work than I think anyone would be willing to do.) My own feeling is we need to revamp this site -- ntl94.com -- and make it more user friendly, especially the forum. Organize the forum groups better, merge redundancies, etc. I also think some stuff on NHL94online should be on this site (like the instructions and download packages) so that nhl94online is strictly for uploading games and keeping statistics. I think a retro trio of, RBI (NES), TSB (SNES/GENS), and NHL94 (SNES/GENS) with the potential to share live tournaments (equipment). There are a bunch of really good sports games that you could run tournament brackets with, but these three games all have an existing mod crowd and tools for customizing rosters. I also don't think that you'd need to incorporate all of the forums together - just have a main page with updates from all platforms and a shared tournament schedule. Come to think of it, the first link in "Join Us" should be a thread that is an overview of this site and the community, and the online events that spring up, as of RIGHT NOW. And it must be kept up-to-date. I remember when I first started getting into things here, after the Toronto tourney, and being overwhelmed. I had an idea that there was online play possible, but the league info wasn't clear. I knew that some people made ROMs, but to what extent, and for what systems, I wasn't sure. I kept hearing about weight bugs and some new kind of checking, but it was all fuzzy. I did ask a lot of questions, and did get a lot of help, but I also got responses like "It's all here", and "do a search". Well, I did! And in a year I wrapped my head around things! IN A YEAR, lol! But a guide that explained the lay of the land right off the bat, one that was up to date, that would have been very handy. It was like finding needles in haystacks, with many dead ends and out of date info. It didn't help that there were a few couple argumentative contrarians that seemed like they wanted to sabotage the newbie experience from the get-go. I will write that guide. Hopefully this weekend. It can be the first link in the "Join Us", and I am sure some people would find it useful. Other people just like to jump in, and can bypass it, and that is ok. But if I write the overview that I wish I had had, that will go a long way for some newbies, I am sure. newbie, oldbie... they don't care. there are multiple staff members with serious bullying issues which they refuse to grow out of. these are presumably 40-year-old men in 2017, still being horrible, negative, nasty humans. and they lead, here. this place must overcome those simple hurdles, first. my welcome back from some time away was a message on my public profile from a moderator. was it a friendly "hey, content producing member, please come back" message? uh... no. it was evil. probably my fault, though, right? after all, I used to stoke a playful rivalry that made this place fun for me. people took it poorly. I apologized and rebranded my persona for more pleasing interactions. this was years ago. staff still actively flames the hate. I invite you all to look at the site staff here. it is 50/50 with well intentioned folks/just straight-up jerks and negative people. there is a lot of discission about the death of this place. don't blame Halifax, Smozoma. neither of them has any love for me, but they are at least no longer gunning for me based on my well-articulated opinions about games. they do positive community outreach. this place should purge the problems from positions of power. I am taking bets on if/when this text is removed out of spite. Tru, I am glad you are back. it was exactly on track and to your point. one can mean well and work for positive change while pointing out the problems. I know you mean well. people assume I do not. I do. I always have. I want this place to continually improve. These are nice, simple URLs as we discussed, that can be put on flyers or even just spread by word of mouth. Note: the "Join Us" is quick and dirty, but functional. I will add some graphics, and change wording. Feedback is welcome.